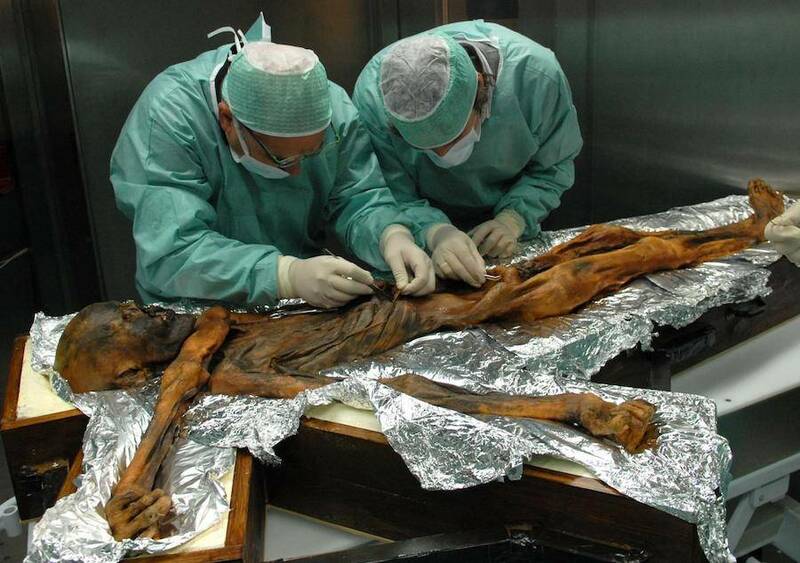 Researchers at work on Ötzi the Iceman. He's the oldest preserved human ever found, and now scientists have extracted the food from his stomach. According to new research published in the journal Current Biology on July 12, Ötzi’s last meal consisted of ibex meat and fat, einkorn cereals, red deer, and traces of the toxic bracken fern. Two mountaineers kneel down beside Ötzi the Iceman just days after his discovery, but before he could be moved, in September 1991. In order to make this discovery, “the most advanced, modern and cutting-edge methodologies were employed through the collaboration with worldwide scientific partners,” said Frank Maixner, lead author and a microbiologist at the Institute for Mummy Studies in Bolzano, Italy, to All That’s Interesting. First, the researchers had to defrost the body — normally kept at 21.2 degrees Fahrenheit to prevent microbial invasion — and then carefully pull the food material out of his stomach. They extracted 11 blobs of crumbly yellow/brown material that had been essentially freeze dried, according to Maixner. 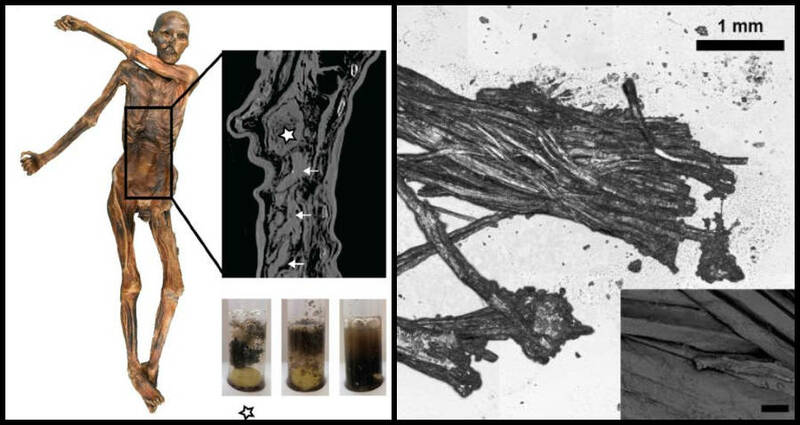 The remains of Ötzi the Iceman’s gastrointestinal tract (left), including bundles of muscle fibers studied by the researchers (right). The chemical analysis of these blobs revealed not only what he’d eaten but also indicated that the meat had likely been dried for preservation before he ate it, given that fresh meat would have spoiled much faster. The toxic fern particles were harder to explain, however. Based on prior analysis indicating that he had parasites in his gut, the researchers believe it’s possible that he ate the toxic bracken particles in hopes that it would treat the intestinal problems caused by these parasites. What made more sense than the bracken was the large presence of fat in Ötzi’s stomach. In particular, the researchers found adipose fat, which serves to store energy. 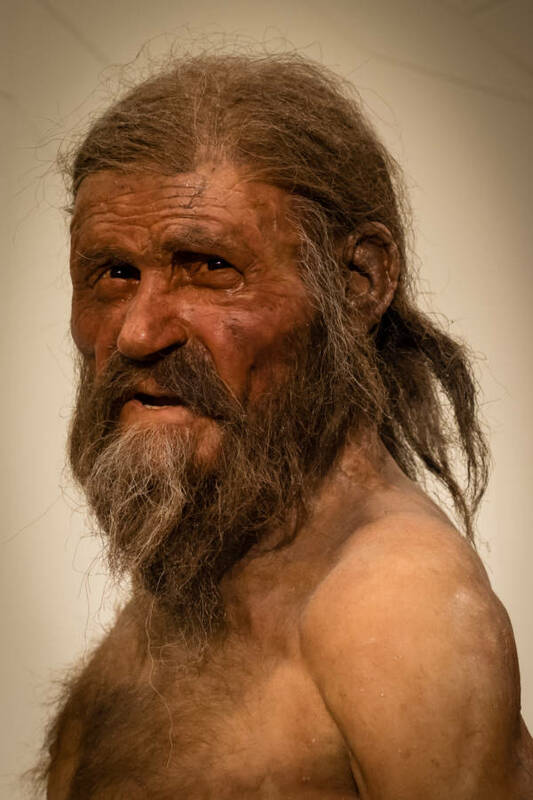 For a man like Ötzi, who lived in a blisteringly cold alpine environment in which food could be scarce, a high-fat diet would make sense in that it would allow him to store energy and survive through the lean times. “The high and cold environment is particularly challenging for the human physiology and requires optimal nutrient supply to avoid rapid starvation and energy loss,” said Albert Zink, another researcher at the Institute for Mummy Studies. A recreation of what Ötzi would have looked like when he was alive. Overall, the contents of Ötzi’s stomach suggested a remarkably well-balanced diet with energy-rich fats, fiber, and protein. But while we now know what Ötzi ate, is it possible that this new discovery can alter the way we look at how people from his time and place ate as a whole? So, even though not much time separates Ötzi and us in the grand scheme of things, the way humans eat has certainly changed immensely since his day.